Most of us will never throw away a still-working screwdriver, but that usually means over the years you collect an unsightly mix of brands, sizes and grips all living in a case that they don't fit properly into. Keep a clear head and a tidy garage with new screwdriver set for less money than you might think. 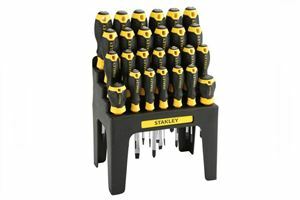 An inexpensive screwdriver set that covers a lot of bases, this collection from Stanley has a great deal to offer. Comprised of 13 screwdrivers including two with Torx heads, it also has a bit-holding screwdriver with a selection of 20 bits, making it ready for just about any situation. It comes in a sturdy case for easy transportation and is frequently available for around £20, making it a real bargain. A brand with a well-deserved reputation for quality and value, this screwdriver and socket set from Draper is ideal for those who want to build their home equipment collection from a good starting point. 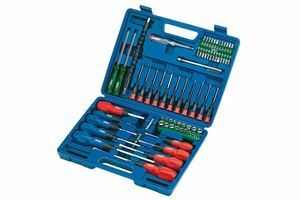 The kit includes 18 sockets, 21 screwdrivers and other useful accessories such as flexible extension shaft for hard-to-reach spots and a magnetic pick-up tool. Another high-value set from Draper, this kit is designed to sit permanently in your garage or workshop on its tidy stand. As well as the most common Philips and flat-head screwdrivers the set also includes Pozidriv and Torx bits to go with the bit driver, and a useful selection of Allen keys. It also comes with the added reassurance of a standard Draper lifetime warranty. 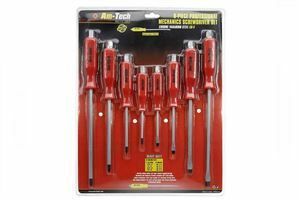 Anyone looking for a hardy set of screwdrivers that can handle the abuse of a typical home workshop should take a close look at this offering from Amtech. 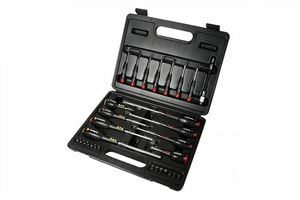 The eight-piece collection is made up of four Philips and four flat-head screwdrivers, with each one featuring a PVC handle with hexagon bolsters so you can use a spanner or wrench for additional torque. Each head is also made from hardened chrome vanadium steel with magnetic tips, helping you to keep your screws under control. 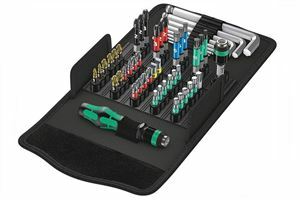 This is a high-end set from Wera, who have a huge range of quality tools and socket sets for those with a bigger budget. This particular kit comprises of 52 parts, with 30 BiTorsion bits and 12 Impaktor bits with longer shafts. It also includes Hex-Plus profile Allen keys that allow 20% additional torque, and the whole thing is supplied in a textile box that won't damage delicate surfaces. A low-cost but wide-use bit set from Draper, it contains a a comprehensive collection of 44 bits including metric and imperial security hex, with each piece made from hardened and tempered with a shot blast finish. There is a sturdy quarter-inch driver to fit them to, and a secure plastic case to carry them with ease. 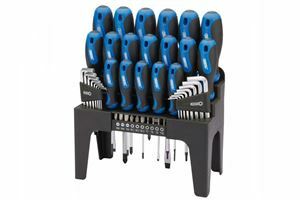 This offering from Stanley is an ideal choice for the home mechanic who is looking for a screwdriver set to install - and keep - in their workshop. 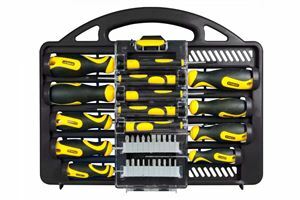 The 26 screwdrivers, including Torx and Pozidriv ends, are finished in the distinctive black and yellow Stanley colours and sit in a matching storage rack, so you'll know immediately if one has gone astray. If you're seeking a new screwdriver set with a good balance of value and quality it's worth considering this offering from Halford's Advanced range of products. 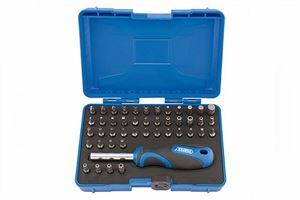 This 30-piece set includes eight full-size screwdrivers with tough handles, a driver with accompanying 14 bits and a set of precision screwdrivers for small-scale work. There's also a handy flexi-drive attachment for hard to reach spots and a smart carry case too. 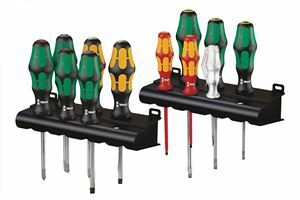 Another high-quality offering from Wera, this 12-piece screwdriver set has a number of smart features to make life easier for you. Each screwdriver has a mix of hard and soft zones in the grip for quick turning but also easy torque transfer, while some of the tips feature a laser-finish that grips into the screw more easily to reduce slippage. The set also comes ready in a wall-mountable stand for easy access. 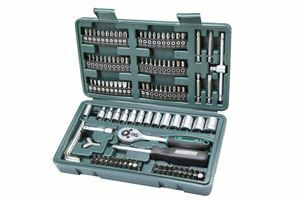 Offering a remarkable 130 pieces for around £20, this socket and bit set from Mannesmann will tackle a broad range of jobs with ease. The set includes a screwdriver and ratchet as well as T-handle for tough jobs, 13 sockets and over 60 bits, Allen keys and Torx drives. Despite the price it also comes with a ten-year warranty to boot.